What better Christmas gift could you ask for than adding a sunroom in the winter? You might think we’re crazy for suggesting this, but we’re actually doing you a favor. If you’ve considered adding a sunroom to your home but just haven’t found the time to do so or keep putting if off – now is the time. Since the demand for building and installing sunrooms is lower during the cooler months, it’s a great time to purchase yours now. You can save time and money getting yours during what most might call offseason. Our home improvement specialists are here to inform you – you can actually use your sunroom year round. Whether you want to enjoy the flowers blooming, warm sunlight, leaves changing, or snow falling. The timing is perfect even if it doesn’t feel that way right now. 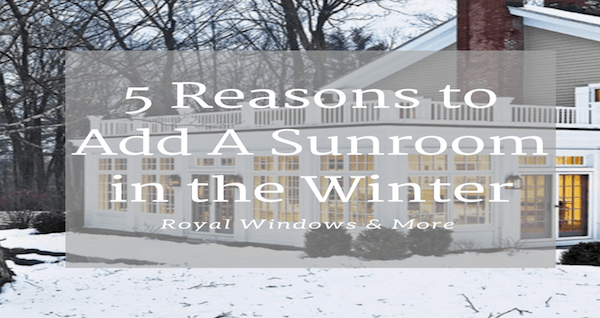 In fact, here are five reasons why you should add a sunroom from Royal Home Improvement this winter. Think of all the warm-season days you can enjoy in your sunroom versus the thought of staring at it while it is being built. Don’t be caught waiting around on the first warm day of spring wishing you were in your sunroom. Save that time now and enjoy the warmer weather when it rolls around. Think of all the time you’ll save instead of waiting months for your sunroom to be installed. Additionally, you can save your pennies. Because the demand for sunrooms is lower in the winter, so are the cost of materials. Due to it being what most might call the offseason for sunrooms, the most installers and contractors aren’t as busy. In fact, many of our Royal team members are looking for jobs to fill up their calendars. Thus, if you decide to purchase and install now, you can save time and be more likely to get an install date sooner than you would be able to if you decided to purchase one in the summer. In case we haven’t mentioned it already, you can use your sunroom year round. It will make for a great place to curl up and gaze at beautiful summer sunsets and crisp fall mornings. Do you have kids? Consider hosting their birthday parties in your new sunroom. A guys night in watching football or a boys indoor camping sleepover could be fun. A ladies brunch would also be a great get together in your homes new addition. Everyone loves the look of winter but hates staying outside to see it because of the chilly temperatures. It can be a great space to host events all throughout the year, especially for holiday parties – talk about a party with a view. Your guests will beg you to host each year now thanks to your new sunroom. No one likes being cooped up in the winter. You can get the feel of the outdoors from the inside of your home thanks to your new sunroom. Enjoy your view while you sip your hot cocoa from the inside of your home while admiring your beautiful view. Think of your sunroom like a bonus room for all your fun events, you better get to planning! Convinced yet? We hope so! Here at Royal Home Improvement, we have just what you need to get started on this beneficial addition to your home. Browse our sunroom selection here. Our contractors are trained and ready to install your new sunroom with precision and care. With the best materials and technology around, we are the experts when it comes to sunrooms. If you’re concerned about your sunroom performing optimally throughout the changing seasons, let us ease your mind! Give us a call or complete our online request form for a free estimate.